Pinterest is a social network where users can visually share and discover new interests by pinning images and by viewing images that others have pinned. Perfect gift for that avid pinner! 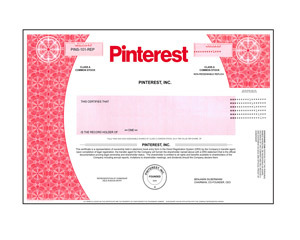 Like all IPOs, Pinterest will register shareholders electronically rather than issuing paper stock certificates. The recipient becomes a real shareholder of Pinterest, Inc. with all associated rights and will get the personalized replica stock certificate to proudly display.